As you've probably heard by now, Condé Nast announced last week that it was shutting down Gourmet magazine, along with several of its other publications. Like many other food lovers, the news hit me hard. But I'm not in mourning for a dear old friend; rather, I'm disappointed about a lost opportunity for the future. You see, unlike most other people who were devastated by this news, I didn't have a subscription to the magazine. I had just begun to immerse myself in its world, devouring editor-in-chief Ruth Reichl's books, buying the Gourmet Cookbook and Gourmet Today, and making recipes from Gourmet via Epicurious. I was dipping my toes in to see if I was ready to leap, and I was. I had a grand plan to request a subscription for my birthday, which is coming up soon-ish (YAY!). I had been treating the act of subscribing to the magazine as a big step towards being a "legitimate" cook, not just one who names her blog "Playing House" because everything's a game or experiment. I was taking this transition very seriously and very slowly, savoring it as I progressed. When I first heard the news, I felt like one of my main motivators had been yanked out from under me. It's hard to be too upset, though, thinking about the decades of magazine archives that remain, the amazing resource that is Epicurious, and the 2 cookbooks I'm proud to own. These recipes should keep me busy for at least a lifetime of learning how to cook. To celebrate the cultural institution that was Gourmet, Julie at A Mingling of Tastes has organized a blogging event to round up some favorite recipes from the magazine. Special thanks to my blogging friend Maggie for posting about it (and I owe her an extra big thanks for turning me on to Ruth Reichl's books too). Julie asked anyone who wants to participate to make their favorite recipe from Gourmet and share it with her. In a few days, she'll post a round up of everyone's beloved recipes, so be sure to check back there on October 19th or 20th. Since I didn't have a favorite (yet), I chose something that I had been wanting to try: Slow-Roasted Tomatoes. We were recently gifted with a big bag of fresh-from-the-garden tomatoes by our friends Cathy and Rodney (they're the folks who introduced us to Oliver at the Humane Society), so the timing was quite serendipitous. 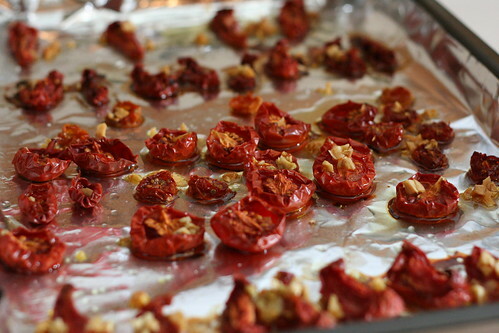 These tomatoes are drizzled with an olive oil-garlic mixture before roasting. Forget scented candles, reed diffusers, and incense. If you want your house to smell heavenly, just pop some of these in the oven and enjoy the aroma throughout the day as they cook down. I tossed ours with some fresh pasta, but they're so versatile, I'll be making them often throughout the winter. 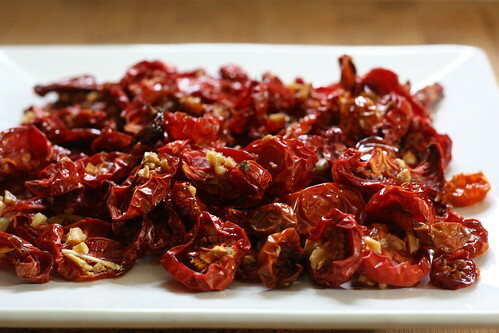 I've read that slow-roasting brings out the best in even crummy store-bought winter tomatoes. 1.Preheat oven to 200°F with racks in upper and lower thirds. 2. 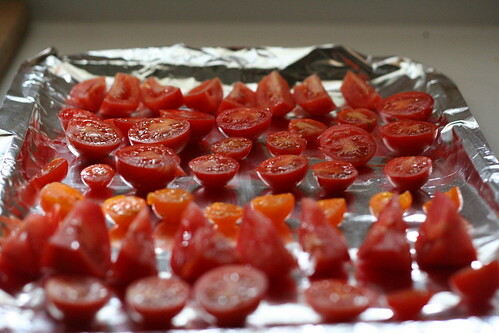 Put tomatoes, cut side up, in 2 large 4-sided sheet pans. 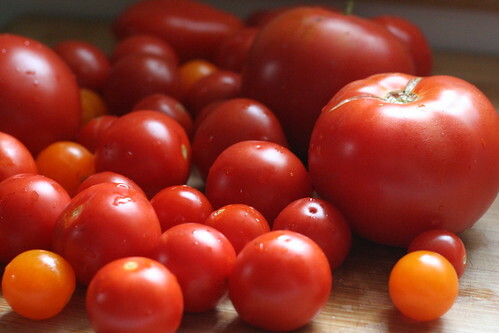 Combine garlic and oil and spoon over tomatoes. Season tomatoes with salt and pepper. 3. Roast in oven 6 to 8 hours (tomatoes will be greatly reduced in size but still moist). Cool. Note: Roasted tomatoes keep in an airtight container, chilled, 2 weeks. Bring to room temperature before using. Wow! Those tomatoes look absolutely amazing =D. I love their colour and how much they shrunk! I can't wait to roast me some tomatoes. I've been trying to think about what to do with the few that have ripened on the vine in our backyard. This sounds perfect. I love the smell of great food in a house almost more than eating it! This sounds like a great recipe to toss with some of the left over Fettuccine I had from the Shrimp and Artichoke pasta from you! hahaha. Love your recipes!!! If you're looking for good cooking magazines to potentially subscribe to, we get Fine Cooking and Bon Appetit (both were gifts from one of my husband's best friends). FC is a pretty fabulous source for cooking info and intriguing recipes, but my beef with it is that they don't produce enough issues! Bon App has gorgeous photography, but I have yet to dive into recipes on that one. Don't be too sad. Gourmet isn't what it used to be and hasn't been for a long time. For the REAL Gourmet, hunt up the early issues, many available at yard sales. Choose the thin ones with stapled spine, not the box spine. Mmm... 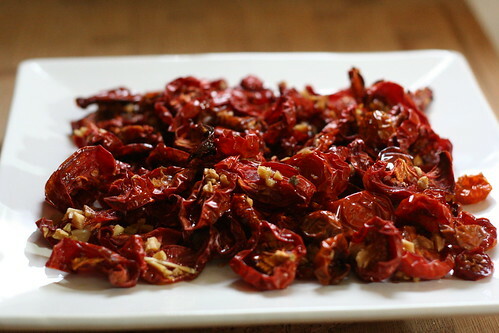 I love slow-roasted tomatoes. I'm so happy you have the Gourmet cookbooks and you're reading Ruth's books. She is truly inspiring! I hope she keeps writing more so that even though Gourmet is gone, she'll still entertain us!